One of the challenges of doing endurance in the Midwest part of the U.S. is that there are not many rides in the heat of the summer, or the cold and snow of the winter. The 2010-2011 winter in the Midwest was a real lulu. Much of the months of December and January were 25 degrees and under. So, we have to travel south to find rides in the winter. We like doing rides in the South, because the people we meet are very friendly, and the vets often have an understanding of gaited horses. Blazing Saddles features one of our very favorite vets, Otis Schmidt. Dr. Otis not only understands gaited horses, he owns a TWH. All we ask for is an even shot, and Dr. Otis always gives us this. This is one of Sandy’s favorite rides because she likes the food. The ride manager, Terry Price, arranges for Southern homemade food the night before the ride and Cajun food after the ride. Sandy had decided months ago to get her 7 year old TWH mare Cheyenne ready for the mare’s first ride. Her thought was that Cheyenne was a long term horse for her and she didn’t want Cheyenne even thinking she might be finished at 25 miles, so she started her out at the 50 mile distance. Cheyenne can be just a little emotional, so Sandy really worked on that issue, and hatched a ride plan to make sure Cheyenne had a calm first ride. Did I mention how cold it had been in Illinois? Cheyenne was as wooly as a sheep. After the 11 hour drive, we had a rest day before the ride. At the vet in, the vet said Sandy needed to shave the wool off of Cheyenne. Fortunately, she had electric clippers. Now, you need to understand that telling Sandy she needed to trim a horse and turning her loose with an electric set of clippers is very much like telling a chocoholic they should add a bit of coco to their diet. Sandy is infamous for her clipping work amongst our gaited buddies. Please note I said “infamous”. There is very little that my little woman can do to make me mad. Approaching any of “my” horses with anything sharp enough to trim hair is an exception to that rule. She has left one of my favorite mares looking like Billy Idol singing “Rebel Yell” with a prominent Mohawk. As it turned out, the neighbor in the next trailer provided help. He mentioned that he and his wife owned a sheep ranch and loved shearing. Sandy was in hog heaven and the results looked pretty humorous. Cheyenne lost a considerable amount of weight in fur. In hind sight, I should have made use of our new friend’s expertise and sheared Kate. 5 minutes before the start, Sandy turned Cheyenne around and went backwards on the course. Cheyenne was the only gaited horse in the 50 mile ride. Sandy started Cheyenne out after the other 20 riders had left. 2 more late starters passed her while she was trying to keep Cheyenne calm and in gait. She looked at her heart rate monitor and discovered it had no signal. At least her GPS watch worked. Cheyenne started out a little rough with a lot of head tossing because she wanted to GO! Sandy calmed her down and backed way off from the last riders, then moved her into an even gait. Cheyenne eased into a racking gait between 8.5 and 13 miles an hour. Cheyenne is a long legged and muscular mare. She is a beautiful bluish grey dapple with a black mane and tail. She has what I would call a “big motor” and is capable of really moving down the trail in a square racking gait. Cheyenne started picking off the horses ahead of her, one by one. She had started the last of 22 riders and finished in 12th place. 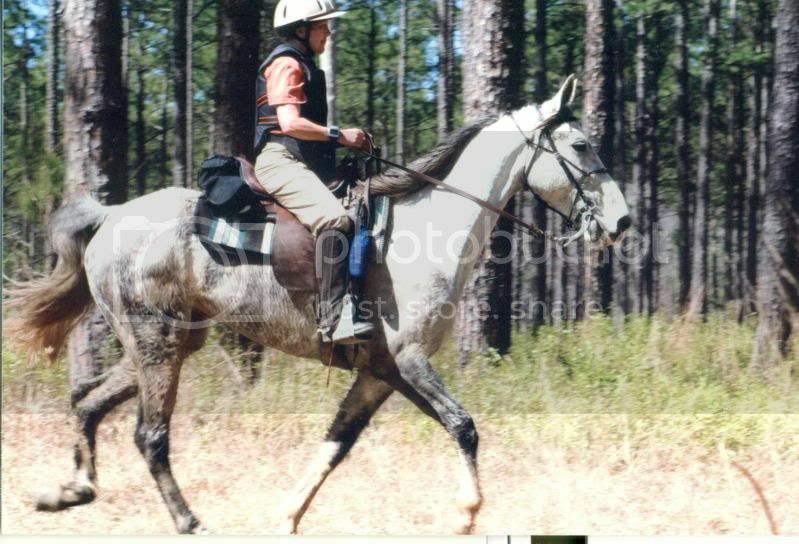 Sandy was very happy with those results on Cheyenne’s first endurance ride, especially after an 11 hour haul. She had all As on her vet card except for one B+ on gut sounds at the 2nd vet check. The 100 started out pre dawn. Kate is about as good as I could hope for during the pre start and many of the Arabians get pretty worked up. My concern for the day was twofold. First, the weather was going to be warmer than previously thought and would prove to be about 80 degrees with high humidity. Secondly, the course was going to be a little different than I had thought and would be about 55 miles of flat road riding. Flat road riding is the worst thing in the world for Kate. I love this little mare and know her like I have never known a horse. 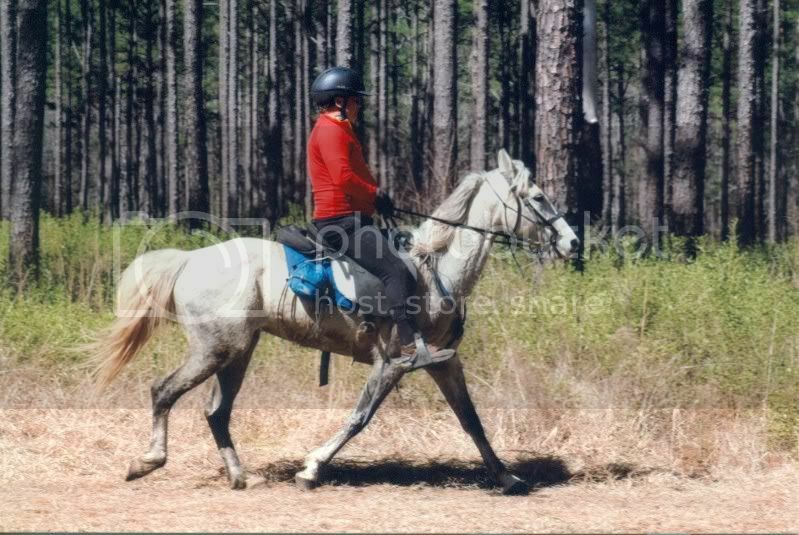 That being said, she is the most challenging gaited horse that I ever ridden. Her running walk is great and very smooth up to 7.5 mph. She then wants to shift into a stepping pace but will, with careful attention rack up to about 11.5 mph. Well, I should have used the word “sometimes” in the previous sentence. I hate a pace. Of course, she will flat foot walk, canter, lope and gallop. She only uses the last three gaits on cue and I very rarely let her gallop. We went out in the dark for the first 15 mile road loop just behind the leading group of 5 Arabians. Yes, all the other horses in the race were Arabians. Things were going well until about mile 8. Kate was all systems “go” and drank well at the only water stop in the 15 mile road loop. Then my ride dramatically changed. Trying to be delicate, I would suggest to you that all of us know what it means to have “nature come calling” in a ride or race. “Nature came calling”, but not with a gentle knock on the front door. It kicked in my door. My camper was 19 miles away at camp. The riders behind me must have thought I had lost my mind because I peeled off the road and headed Kate into the woods in a hurry. As I tied Kate to a tree, she seemed to look at me with a confused eye. Meanwhile, there was an endurance ride passing us by. My friend Paul Sidio caught us once we were back on the road. I was very glad to have company as I really did not feel well. We finished the first 24 mile loop together and I saw Sandy come into the ride camp after Kate had cleared the vet check with flying colors. I don’t think I would have been labeled as “fit to continue” if the vets had looked closely at me. Sandy has a frozen shoulder and Cheyenne is so tall Sandy had to use a picnic table to mount her. I made the decision to let my out time slide by to help her, and just take the turtle award with Kate. This decision was fateful later. As Kate and I headed out alone, the temperature rose to about 80 degrees. By mile 40 I was so dehydrated that I was seeing orange colors in the woods that I knew were not real. My thoughts became cloudy and I had to concentrate to stay upright on the horse. I got dizzy and caught myself leaning forward in my English saddle to stay upright. Kate took care of me and we slowed down. We were now firmly in possession of the turtle, which of course means we were last. I just wanted to complete and try to keep hydrated as well as I could. We headed out of the mile 70 vet check with only one B+ on our vet card to go with a lot of “A”s. Kate seemed to have a loss of energy from mile 75 to mile 80. When her energy level dropped, we walked and then picked up to a running walk for a while. Her heart rate during this time was often between 80 and 90. She really picked up energy from mile 80 to the next vet check at mile 85. Thankfully, Sandy was waiting for me at ride camp and as soon as Kate dropped her heart rate, I headed to the trailer for my own needs. When I went back to climb back into the saddle, Sandy and the vets where still looking at Kate. Sandy had counted 24 swallows at the trough during the break and Kate had eaten well. But her gut sounds were quiet and she did not look perky. Her heart rate was a bit higher than normal for her. Her gut sounds came back on all quadrants, but I did not think Kate was herself. I simply did not like the look in her eye. I rode this horse 1000 miles last year and I have bonded with her in a way I did not know a rider and horse could bond. Dr. Otis mentioned her eye. I interrupted him and said that was “exactly what I am concerned about .“ I told the vets that Kate had taken care of me all day and that I was making the decision to take care of her and we were taking a “rider option” if they would allow it. They did just that. Kate was fine after the walk to the trailer and some more eating and water. Paul said I was seeing the reflection of my own eye in Kate’s eye, riding the end of a flat hot 100 by ourselves. With almost 8 hours left and only 15 miles to complete I could have walked or jogged with her but I did what I thought was right. We both healed up and I learned or relearned three valuable lessons. 1. Always take care of your horse. Awards are nothing in relation to the welfare of your horse. 2. Never, EVER, eat a plate of fried hot peppers before 100 mile ride, no matter how hungry you are. 3. Just because you ride a horse that doesn’t trot during a ride doesn’t mean you might not end up trotting yourself.